Have you ever considered that you have a natural time management style type? Or have you noticed that your friends and family members may approach managing time differently than you? Have you ever wondered why certain people seem to be better able to manage time than others? Do you take your personality traits and habits into account when planning and scheduling tasks? Do you have any idea how your personality type affects how you manage your time? We all have natural behaviors regarding how we manage time and how we organize our living and working spaces. Sometimes everything seems to work well for us, but tension can arise when we become inundated, over-scheduled and blocked with clutter. When this happens, it’s important to understand our dominant time management type so we are better able to work with our natural style preferences. If we don’t, we can get in our own way, impede our best intentions and miss our goals. Understanding what techniques, behaviors and products work for you, and what does not, impacts the overall quality of your life. There are six different personality types for managing time. Each person is different. One may strongly align with one type as dominant, where others may display behaviors of several. Read the list below, and see where you think you resonate. The Hopper™ style maintains her energy by staying busy. A hopper loves switching tasks, and finds having several tasks going at one time exhilarating. Hoppers typically transition with ease, stopping one activity to transition to something new. This style personality gets involved in many things, and may have a difficult time completing tasks if there are too many brewing at one time. As such – sometimes dominant hoppers may have a litany of incomplete tasks, and struggle with follow-through. How Hopper Time Management Personality Style Types Can Manage Time More Effectively: When possible, Hoppers™ should eliminate distractions to offer themselves more uninterrupted chunks of time in which to finish tasks. Timers may help them stay on track. They will also find it helpful to be aware of shifts in their energy levels to recognize when they need to take a break and thereby reduce the odds of being distracted. The Hyper Focus™ time management style is absorbed by detail and often has trouble stopping one activity to transition to something new. This style preference gets so involved in what they’re doing that they may ignore reminders and cues to move on to the next priority. When Hyper Focus™ people are deeply involved in the task at hand, they can become so absorbed in the details, that they can lose track of time. How Hyper Focus Time Management Personality Types Can Manage Time More Effectively: It’s important for Hyper Focus™ people to work from a prescribed plan and create natural bridges with strategies for moving from task to task. They can benefit from using backwards planning and scheduling to determine necessary project phases and start/finish dates, as well as chunking time into 20 minute segments. Big Picture™ individuals are big thinkers but sometimes ignore details, or may leave the details out of their plans entirely. Big Picture Personality Types find details less attractive than global strategies. They are typically quick thinkers and excel at tasks that call for spontaneity. Their lofty vision and high speed of action can cause them to overlook or ignore the essential small pieces necessary for success. How Big Picture Time Management Types Can Manage Time More Effectively: Big Picture types are much more effective when partnered with people who will handle the details and follow-through on tasks. On their own, they need to create simple, basic routines to follow, write things down, and make sure that their communications are clear and precise. Perfectionist Plus™ types thrive on details and an endless pursuit to ‘get things right’. As such, they have very high personal standards. They believe that they should be able to do nearly everything themselves and do it all well. They may be overly concerned about other’s approval and often have difficulty saying “No” to the requests of others for their time. How Perfectionist Plus Time Management Personality Types Can Manage Time More Effectively: Perfectionist Plus™ types must learn to distinguish between high and low priority activities so that they can spend their time on those with the highest payoff. If everything is important, nothing is really important… so Perfectionist Plus personalities need to learn to evaluate tasks upon acceptance, and then learn how to say no to things that are not important to them. This may involve disappointing others (which they really don’t like to do…) and learning to let go so they can delegate tasks where possible. Of course, this involves aligning with others they trust will do a good job. When they begin to develop these growth actions, they’ll find they have more room on their plate for the things they most enjoy. Impulsive™ Time Management types love to leap but may forget to look first. Enjoying the rush of adrenaline, they would rather act spontaneously than follow a pre-set plan. However, lack of planning, or diminishing its importance, can result in missed deadlines and letting others down. Impulsives tend to get bored easily and can find routine and maintenance tasks distasteful. Impulsives run into trouble when the feed their impulses more often than finishing tasks. How Impulsive Time Management Personality Types Can Manage Time More Effectively: It’s helpful for Impulsives™ to gain perspective by looking at the bigger picture in order to make better decisions. They will benefit from longer-term planning, routine reviews, and daily targets that allow time for spontaneity. Posting mantras, intentions and reminders of their overall goals will often help remind them to stay focused on their highest priorities. Cliff Hangers™ believe that they work most effectively when under the pressure of a deadline. They like having an adrenaline rush which helps them focus, but when they run their deadlines with this approach this often doesn’t leave enough time to check work thoroughly or to handle things that might go wrong. Waiting to start until the last moment often causes added stress, tension and even missed deadlines. How Cliff Hanger Time Management Personality Types Can Manage Time More Effectively: Cliff Hangers™ need to monitor their time to better estimate how long things really take to complete. They will benefit by identifying their highest priorities and scheduling earlier start dates for those tasks. If they still choose to procrastinate, it should be on the less significant priorities. Have you wondered what your time management personality type is? You can easily learn all about your time management personality with the Time & Space Style Inventory. Once you identify your time style personality preferences (Hopper, Hyper Focus, Big Picture, Perfectionist Plus, Impulsive, and Cliff Hanger) you can begin to take steps to integrate more Flow into your experience. The Time & Space Style Inventory™ (TSSI™) is an online assessment tool that evaluates your organizing personality type and your time style preferences. It helps you determine your natural approach to how you manage priorities, attend to details, and take action. By learning your dominant and strong style preferences, you can make the most of your time and choose to take actions that increase flow in your life. Consistently taking the Flow Steps in your styles of dominance will help you successfully manage yourself, and your decisions about time. Embrace your natural Time Management Personality Style! 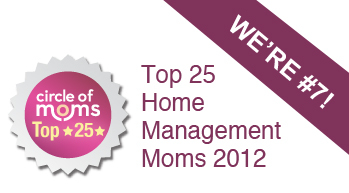 Make it work for you – take the Time & Space Style Inventory™ and see what makes you tick! When you identify your dominant time and space personality style preferences you make better, more informed decisions, become more productive and unltimately enhance your experience so you can enjoy your life @ http://bit.ly/tssifree. 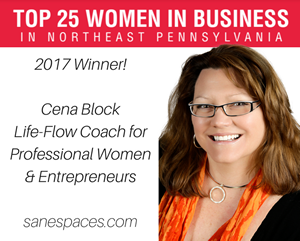 Cena Block (sanespaces.com) specializes in helping moms design their home-based businesses on their own terms. We build smart supportive systems that create time for living. 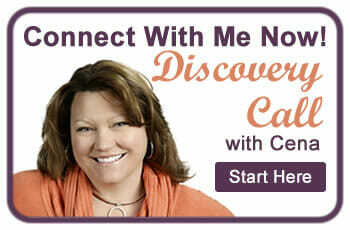 A productivity expert with more than 25 years of experience in human performance and training, Cena has collaborated with professional organizer and author Sunny Schlenger (suncoach.com) to create the Time & Space Style Inventory™. This is the only online assessment tool that not only identifies natural time management and space organizing styles. Your personalized TSSI Style Report comes with 60 days access to the TSSI Hub. It contains everything you need to create a personalized roadmap to manage your time and space. Find Sunny’s new book: Flow Formula: A Guidebook to Wholeness and Harmony on Amazon.com.